Fireworks on New Year's Eve, Grace Bay, Providenciales. The Turks and Caicos sees several unique annual events and holidays, which can be a great complement to a vacation in our Beautiful by Nature archipelago. The 2017 New Year's Eve fireworks over Grace Bay. 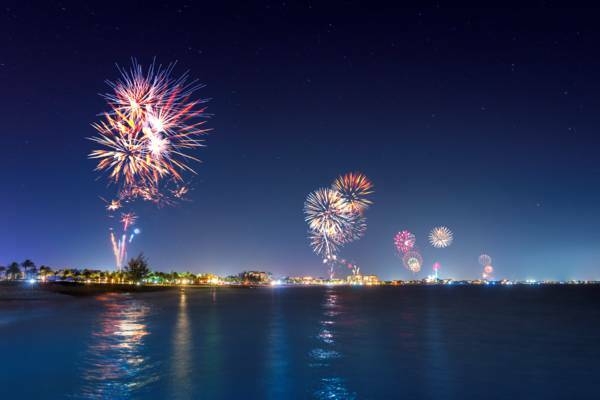 The most impressive display of the year is the fireworks over Grace Bay Beach on New Year’s Eve. Many of the larger resorts on Providenciales put on their own fireworks display, and when the clocks hit midnight, the entirety of Grace Bay lights up! It’s not just fireworks. There are often several beach bonfires going (the largest is usually at Ricky’s Restaurant), and sky lanterns can be seen floating away during the whole night. The Caribbean House Evolution boat and music celebration in the Turks and Caicos. Another local event that’s rapidly gaining traction is the multiple day Caribbean House Evolution music festival. This mega party (by Turks and Caicos standards!) typically takes place over three days in mid-summer, with a beach party, pool party, and finally, a boat party at the uninhabited island of Water Cay. As the festival’s name suggests, the event is centred on the Caribbean house music genre, and the event has begun to attract attention from international DJs. 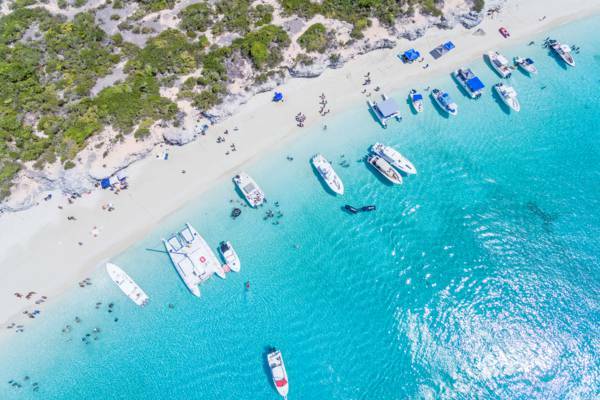 The boat party day of the event can be quite impressive, as the more than fifty boats, ranging from small vessel to beautiful yachts, make the short hop over to Water Cay and anchor at the beach. The Caribbean Food and Wine Festival, which is hosted by many local businesses and organizations, is a multiple day event showcasing the best of dining and wine in the Turks and Caicos. The festival offers several daytime and evening events at popular gourmet restaurants and resorts across the islands. Tickets are sold per event, so patrons can enjoy a single brunch, or the full schedule. 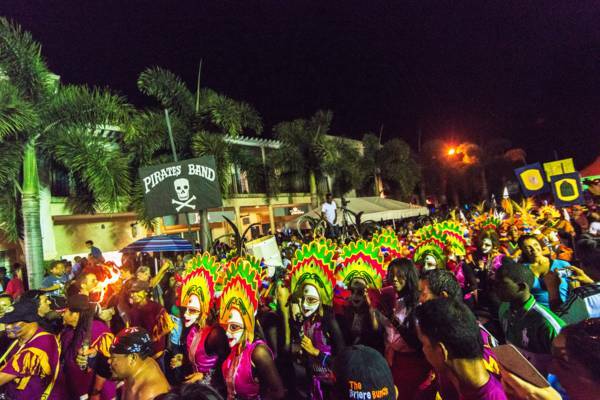 The Maskanoo street festival in Grace Bay. Maskanoo is a street festival held on Boxing Day (Dec 26), and combines elements of masquerades and traditional Bahamian-style Junkanoo. Maskanoo is hosted by the local hotel and tourism association, and the event takes place in the evening on Grace Bay Road in the heart of the shopping district. Craft and food venders also offer a wide selection of goods. The culinary Conch Festival is held in November in the traditional fishing settlement of Blue Hills on Providenciales. This event celebrates the Queen Conch and everything it represents in the Turks and Caicos. Local restaurants vie in creating the best conch dishes, including conch fritters, salad, and stew, international conch fusion flavours, and much more. The Conch Festival is also a great place to see local conch shell crafts and handmade jewellery, such as the unique designs of the Wellington Collection. The annual Wine Cellar Golf and Fishing Tournament is another favourite event with locals and visitors alike. Hosted by the Wine Cellar, a local alcohol importer, this tournament offers a two day deep sea fishing competition, and one day golf challenge, with prices totalling nearly $100,000. The deep sea segment of the tournament awards cash prizes on the heaviest game fish caught, typically mahi-mahi, tuna, or wahoo. The golf half of the event take place at the beautiful Provo Golf Club in Grace Bay, and sees four person teams compete for the title. The event raises money for local youth centres and sporting organizations. All proceeds go to charity. The Valentine's Day Cup model sailboat race at Bambarra Beach, Middle Caicos. 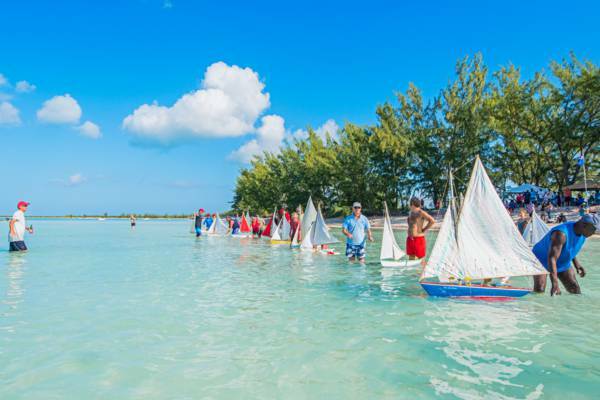 The fun and quaint Valentine’s Day Cup is a model Caicos Sloop sailboat race that takes place on the quiet island of Middle Caicos on the Saturday nearest Valentine’s Day. The tournament is a great event for families and children, and offers a fun beach day with local food and music. It’s held at the tranquil Bambarra Beach, which offers calm and shallow water, white sand, and the beautiful Pelican Cay. The Valentine’s Day Cup is a great excuse to visit the spectacular islands of North Caicos and Middle Caicos on a day trip. There’s a plethora of natural sights and secluded beaches to discover.